How are things, friends? Have you been working on any fun sewing or quilting projects. I've been sort of all over the place lately with tons of screen printing, pattern designing, but also some "just because I feel like it" sewing. I sewed up this pretty simple, yet very chic I think, bucket bag for myself. I fell in love with waxed canvas a while back, and I knew it would pair up beautifully with my own screen printed linen, leather, and lots of brass hardware. I'm actually still a bit surprised at how much I love brass bag hardware these days. I've been silver / nickel only kind of girl for years now so this is a new, and very welcome change for me. I'm happy I finally got to use this leather snap closure. It's been sitting in my studio for years now as I never seemed to have just the right project to use it in (it probably has something to do with the above mentioned silver hardware only "policy"). I hand stitched the snap in place once the bag was finished. It was a bit fiddly, as you can probably imagine, especially since I didn't want my stitches to show on the lining side, but well worth a bit extra effort. And, I added a zipper pocket to my lining. I always add zipper pockets to my purses, but this was the first time I did a pocket this way. I love the way it looks and I'm sure you'll keep seeing it in my bags from now on :). I also departed from my usual quilting cotton lining and used canvas instead. I worried a bit that it would be too stiff and hard to work with, but I completely fell in love with it as it sewed beautifully and it helps the finished bag to hold its shape. Oh, I greatly appreciated no need to add interfacing to the lining. All in all, I'm super pleased with the way this bag turned out. I think it will make a great fall/ winter everyday bag. And, in case some of you wondered, I will be turning it into my next pdf pattern. Stay tuned. You can now purchase this pattern by clicking here. I'm a huge fan of Blogger's Quilt Festival as I greatly enjoy seeing all the amazing quilts submitted by many, many talented quilters so I was super excited it's finally here. I haven't done much quilting lately, but I thought this would be a great time to once again show off my Scrappy Improv quilt (yes, my kids make fun of my inability to come up with any good quilt name constantly :)) . This, without any doubt, is my most favorite quilt I have ever made. Ever! I love that it's scrappy, yet not your "usual" scrappy full of color and gazillion fabrics. I love that the whole time I was making this quilt I had no idea where it would end up, or even if I'll like it :). I also love the simple straight line quilting and a bit of chunky hand quilting here and there. And, of course I love the beautifully soft minky backing and the most fantastic red and white binding. Such a super, super happy way to frame this quilt. To read more about this quilt you can click here to be taken to my original post. I've submitted my quilt to Scrappy Quilt Category. And don't forget, anyone and everyone can submit their quilt to Blogger's Quilt Festival. Hope to see your amazing creations there. I'm super excited to show you my newest sewing kits. I so love the modern, minimalist look of these screen printed needle books. There are four different kits available at my etsy shop. They each include screen printed exterior as well as lining panels, fusible fleece, wool felt for pages, and leather lace for a tie. Oh, and the instructions booklets, too. Each needle book finishes at 3" wide x 4" tall when closed. 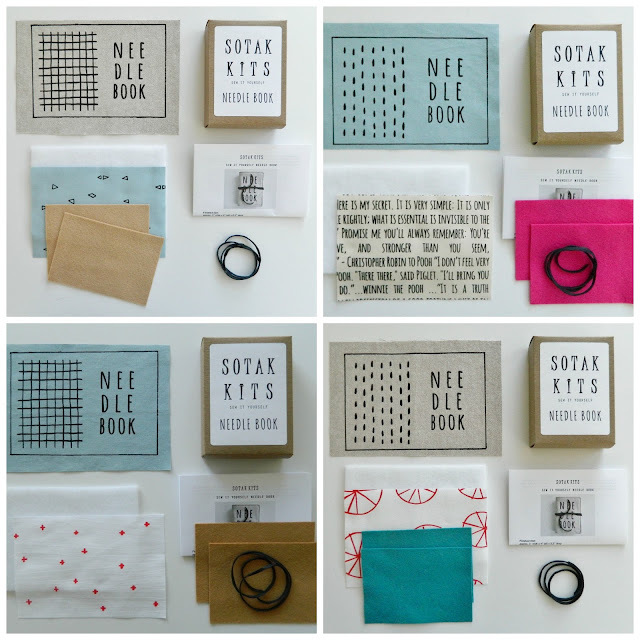 I greatly enjoyed designing these needle books and hope you'll love them as much as I do. The other day I suddenly noticed I had way too much fabric in my stash. Probably not too much by most quilters' standards, but definitely too much for me. So, I decided it was time I used up as much of my fabric as I possibly could making simple useful everyday projects. 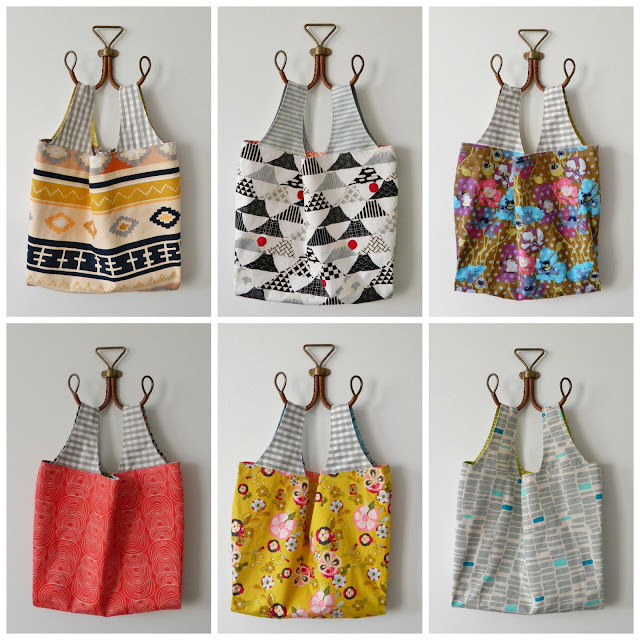 First on my list were these reusable grocery bags (pattern by Michelle patterns). I usually buy my fabric in 1/2 yard cuts so this pattern is absolutely perfect as all you need to make this bag is two 1/2 yards of fabric for exterior and lining, plus another 1/2 yard for the handles. I combined heavier weight fabrics with regular quilting cotton and I'm especially glad I used pretty fabric not just on the outside, but also for the lining :). These will be a great addition to my stack of reusable grocery bags I made a few years back. I use them all the time and they hold up so nicely. No ripped seams, just wonderful. In case you're on the lookout for a good reusable grocery bag I highly recommend this pattern. I'm sure you won't be disappointed. So tell me. Do you sometimes feel overwhelmed by the amount of fabric or art/ craft supplies you own? How do you deal with it? I'd love to know. I'm super excited to show you my newest pattern today. If you've been reading my blog for a while you know I greatly enjoy making (and using) drawstring bags. I love how quick and easy to make they are. Plus, they are perfect to keep projects on the go, toys, craft supplies, ... organized. This pattern includes instructions on how to make fully lined drawstring bags in four different sizes. 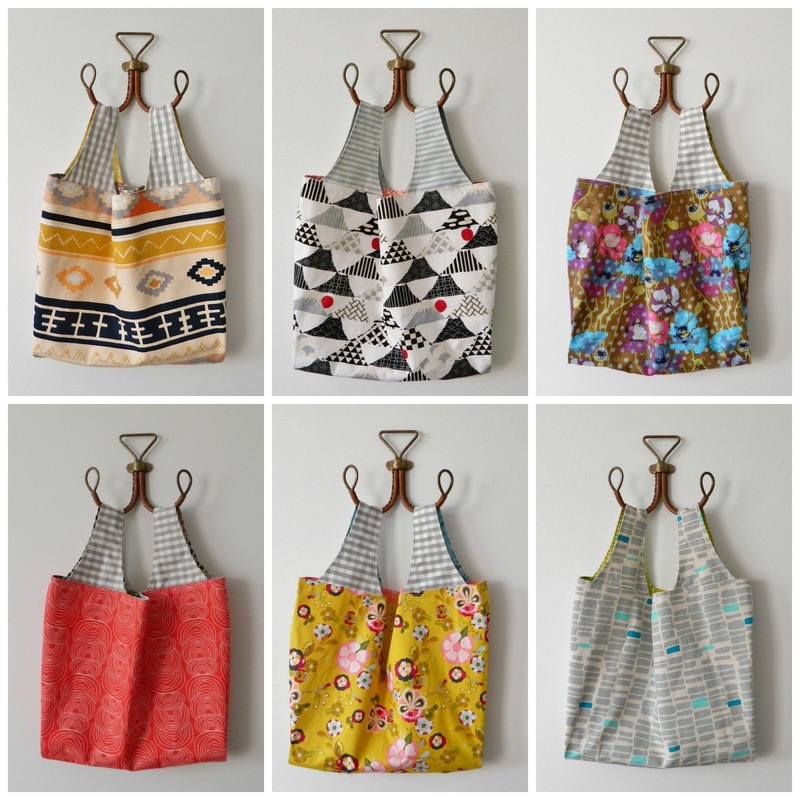 And, each bag can be made using just one print or is perfectly suited to be made using 2.5" squares if you prefer a more patchwork-y look (instructions for both versions are provided). As I said before, I love using drawstring bags to keep my projects organized, especially my knitting. I made myself quite a few bags already and I keep all the supplies I need for that project in one bag. I usually make the large size drawstring bags for my knitting, the medium and small sizes are perfect for smaller knitting or crochet projects, and the mini one is just the right size for all the notions. Drawstring bag pattern is now available at my etsy shop or you can purchase it directly by clicking on the button below. The price of this pattern is $5.00. 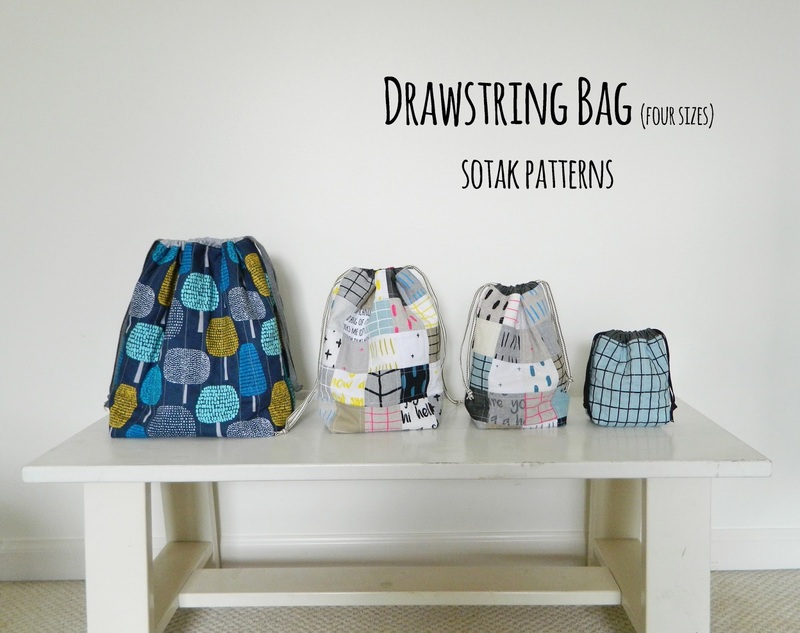 Hope you will enjoy making these super handy drawstring bags as much as I do :). I've been meaning to make myself a simple everyday tote bag for quite some time. So, when I suddenly found myself with an afternoon all to myself and no urgent things on my to do list, I decided to gather all my supplies and got to work right away. I combined my screen printed canvas for main body and waxed canvas I had on hand for the bottom of the bag. I then added leather handles, and rivets. Oh, I can't even tell you how much I love adding leather and rivets to my projects :). The bag finished at 12" wide x 13" tall x 3.5" deep. I'm sure it will get used a lot as it turned out just the way I wanted it to. Don't you just love when projects end up looking just the way they did in your head? I certainly do :).